Since the 2013 Dodge Dart was introduced at the 2012 North American International Auto Show (NAIAS) in Detroit, it has been expected that Dodge would eventually introduce a performance oriented model sporting the familiar R/T trimline designation that is used by the current Charger and Challenger. The Chrysler Group even offered up information on the upcoming Dart R/T but the company shocked everyone when they release the full information on this performance model but rather than R/T, the company went with the name Dart GT. The decision to opt for the name Dodge Dart GT came as a surprise mainly because the company seemed set to run with the R/T trimline for this model but considering that the Dodge Dart of the 1960s and 1970s used GT instead of the R/T designation used by the old school Charger and Challenger – it makes sense for the 2013 Dart to bring back the GT moniker. While the 2013 Dodge Dart is a far cry from the Dart from back in the day, the Chrysler Group likes calling upon vintage names and trimlines for new models so Dart GT makes a great deal of sense. Shy of the name of the 2013 Dodge Dart GT, there are not many surprises with this performance themed trimline but that didn’t make this sporty compact sedan any less significant when it made its world debut at the 2013 NAIAS. Parked alongside the familiar Dart Rallye and Limited models, show goers have a chance to see how the Dart GT compares to the Limited (which is more of a luxury package) and the Rallye (which served as the performance option for those who purchased a Dart during the 2012 calendar year. Overall, the 2013 Dodge Dart GT doesn’t vary from the Dart Rallye all that much with these two trimlines sharing a basic front end design that includes a black upper and lower grille opening with a black center section of the front fascia connecting these two air intake openings. Like the Rallye, the Dart GT wears gloss black fog light bezels that house the projection fog light assemblies with more gloss black in the headlight bezels to bolster that sporty look and feel. The key difference along the front end is the trim on the Dodge crosshair grille which is bright red on the Rallye but for the Dart GT, the crosshairs are trimmed in silver for a more upscale look. Along the side, the 2013 Dodge Dart GT wears a unique set of 18 inch gun metal grey wheels in a 5-spoke design that fill the flared wheel openings beautifully while the back end wears the same dark rear fascia area with large polished integrated exhaust tips. While the 2013 Dodge Dart GT doesn’t look at that different from the other trimlines in the Dart stables, under the hood is an engine that is currently not available with any other package. The 2.4L Tigershark 4-cylinder is a naturally aspirated mill that churns out 184 horsepower and 174lb-ft of torque which makes the GT the most powerful option in the Dart lineup – until the Dart SRT4 arrives later this year. This power is channeled to the front wheels via either a proper 6-speed manual transmission or a 6-speed AutoStick automatic transmission. Inside, the Dart GT is fitted with just about every option that a new Dart buyer can select including the TFT customizable gauge cluster and the gorgeous 8.4” infotainment touchscreen that controls pretty much every aspect of the interior. The 2013 Dodge Dart GT is really a great looking package with enough power to make it a more engaging model than the Dart Rallye powered by the 1.4L turbocharged Fiat engine. Those early Dart buyers in 2012 who wanted a sporty Dart opted for the Rallye but with the introduction of the new Dart GT – buyers who want a high performance Dart without the higher price that will likely come with the heavily modified Dart SRT4 will find a comfortable new home in the 2013 Dart GT. The 2013 Dodge Dart GT will go on sale later this year and when it does, it will carry an MSRP of just $20,995 so it is somewhat of a bargain sport package when you compare the GT to both other Dart sedans and competitors in the class from other companies. Click here for more information on the 2013 Dart GT from the original announced earlier this month. 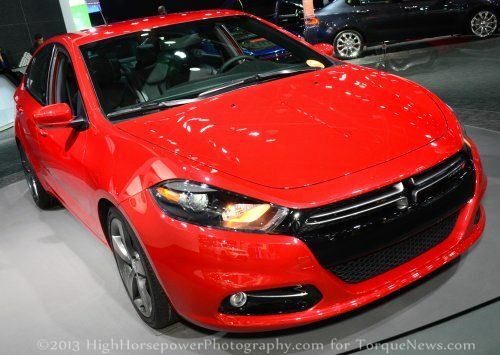 We have put together a gallery of the 2013 Dodge Dart GT from the 2013 Detroit Auto Show and you can check that out by clicking any of the thumbnails above on the right! 184 hp Tigershark? Jokes flood my mind.